This lovely patient felt her nose was generally too big and wide. 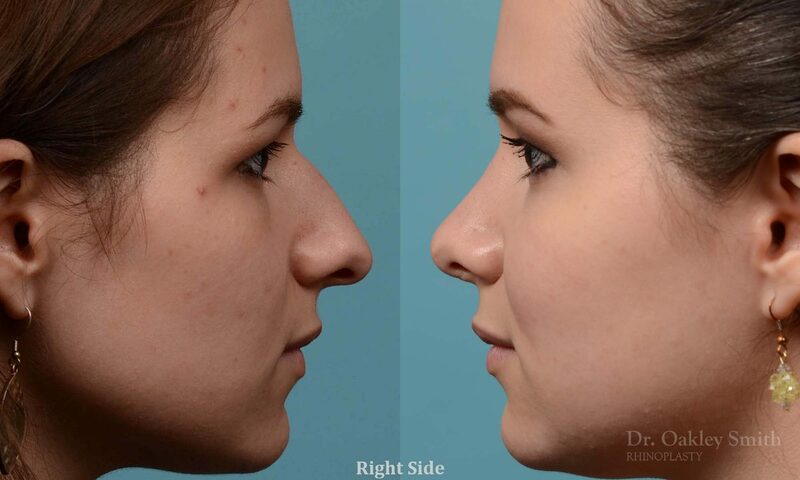 She didn’t feel the bump was feminine and wondered if her nasal base was too wide. 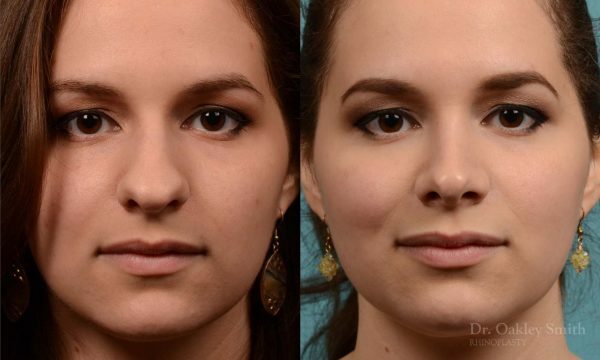 Given her nasal anatomy and skin thickness, Dr. Oakley Smith felt her tip could be de-projected towards her face 4 millimeters 70% of the time and at least 2 millimeters 90% of the time. She was told she would have an improved appearing nose, but there would be minor imperfections, as surgery cannot produce perfection. After surgery, it’s clear her roundness of the tip has been well corrected. Her tip was brought back 3 millimeters by shortening the superior tip cartilages. This also caused her tip to rotate upwards and get rid of the drooping. Her external skin scar between her nostrils below her nose can be seen. It is more visible than preferred. This illustrates how surgical outcomes can’t be predicted and issues such as this occur. The better and more experienced the surgeon, the less likely issues like this happen. Her photos were taken over 2 years following surgery. She had unfortunate obstruction to breathing due to her surgery. This is a complication occurring about 1-2% of the time. In her case, the tip cartilage had dropped into the nasal channel as she healed. One year after her first surgery, she underwent a second procedure under local anesthetic to correct the issue. Although only a minor procedure, its success rate is in the 50-60% range. Fortunately in her case, it was successful and restored her breathing to normal.